Di San Xian (地三鲜) is a signature northern Chinese dish from the Dongbei Area (or Northeast China). 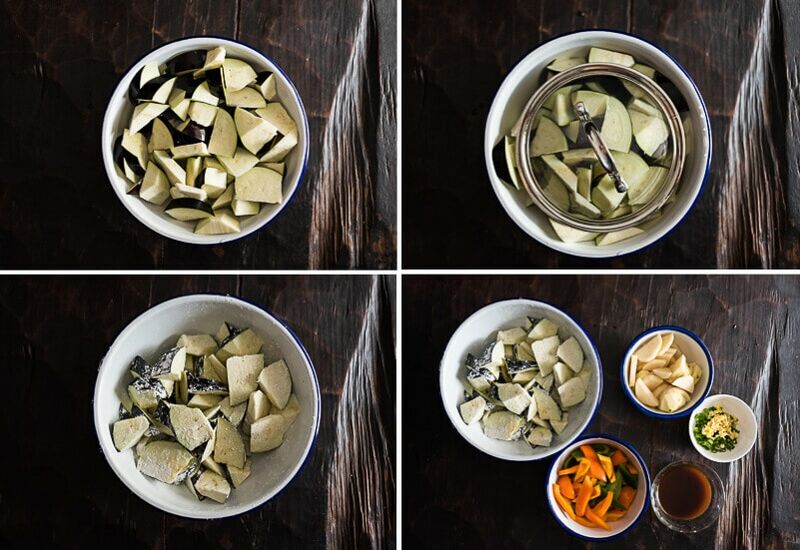 The name Di San Xian means “three treasures from the ground”, representing the potato, eggplant and green pepper in the dish. These are the most common vegetables in any market in northern China which can be found all year round. Like many other Northeast Chinese dishes, the cuisine emphasizes a family style presented in a rustic way that is often viewed as less elegant. However, the cooking method does turn these three plain vegetables into a feast that has your mouth watering simply by looking at it! To cook Di San Xian in restaurant style, you will need to quickly fry all the ingredients in hot oil in the wok. 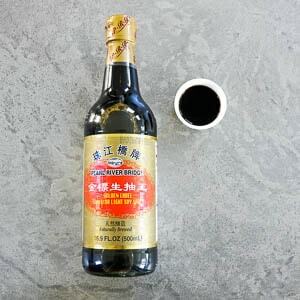 It is called Guo You (过油) in Chinese; literally meaning to walk the ingredients through the oil. This creates a crispy crust outside of the veggies without using any batter. When it comes to home cooking, I try to avoid deep frying as much as possible. So I’ve developed a few tricks to create crispy veggies with less oil and a cleaner kitchen counter. The veggies will brown beautifully with a crispy char on the surface and tender inside, just like you find in a restaurant. To enjoy Di San Xian, serve it hot on top of steamed rice or boiled noodles. I guarantee you’ll finish a big plate in no time! Although Asian eggplant generates better results, I’ve successfully cooked with regular eggplant. 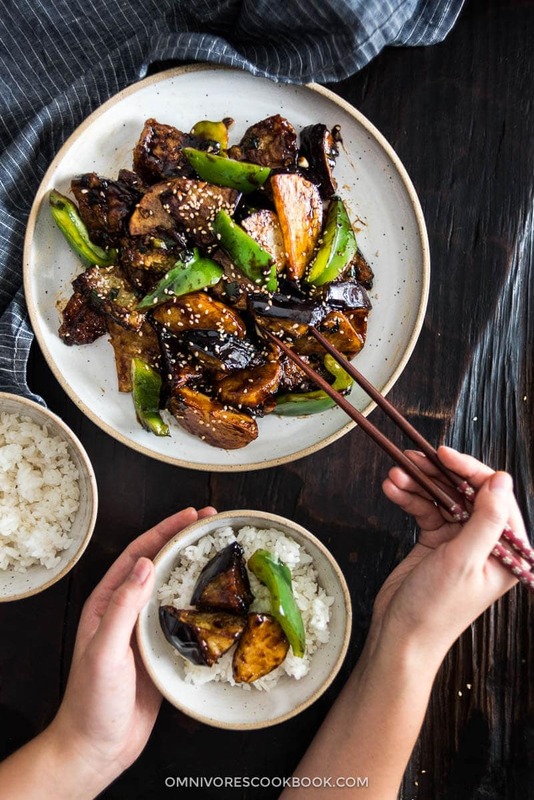 As long as you follow the method in the recipe, your eggplant will turn out crispy. Soak the eggplant in salt water for 15 to 20 minutes, dry thoroughly, and then coat with cornstarch. This is my default method to create crispy eggplant without deep frying. Slice the potato into half-moon shapes instead of cutting into wedges so that both sides crisp up perfectly in the pan. Use just enough oil to cover the pan to shallow fry the vegetables instead of deep frying. After making countless stir fry dishes, I’ve found again and again that cooking in small batches creates much better results. The recipe below only yields two servings (as a main). You can always double the recipe, but remember that you need to pan fry the veggies in small batches to achieve the best outcome. Happy cooking and hope you enjoy the dish! Add eggplant into a large bowl and sprinkle with 2 teaspoons salt. Add tap water to cover and stir to dissolve the salt. Use a small plate or a lid to cover the eggplant pieces and submerge them in the water. Soak for 15 to 20 minutes. Drain eggplant and dry thoroughly with a paper towel. Sprinkle with cornstarch and gently mix by hand, until the eggplant pieces are lightly coated. Combine vegetable stock, light soy sauce, cooking wine, sugar, salt, and cornstarch in a small bowl. Mix well and set aside. Heat a large pan (or a wok) with 1/3 cup oil over medium-high heat until hot. Place the eggplant in the pan and spread the pieces without overlapping. Cook the eggplant without moving it until the bottom turns golden brown. If the oil in the pan is fully absorbed by the eggplant before cooking through, add a bit more oil to the pan. Turn to medium heat when the pan start to smoke. Flip the pieces to cook the other side until golden brown. Transfer to a big plate. Your pan should still have plenty of oil since the eggplant will start releasing oil once cooked. Spread the potato pieces in the pan. Cook without moving until the bottom turns golden. Flip to cook the other side, until golden. Transfer to the plate with the eggplant. If your pan still has too much oil, carefully remove some with a folded paper towel and only leave about 1 teaspoon oil in the pan. Add green onion and garlic and stir a few times until fragrant. Mix the sauce again to dissolve cornstarch completely. Pour into the pan. The sauce will thicken immediately. 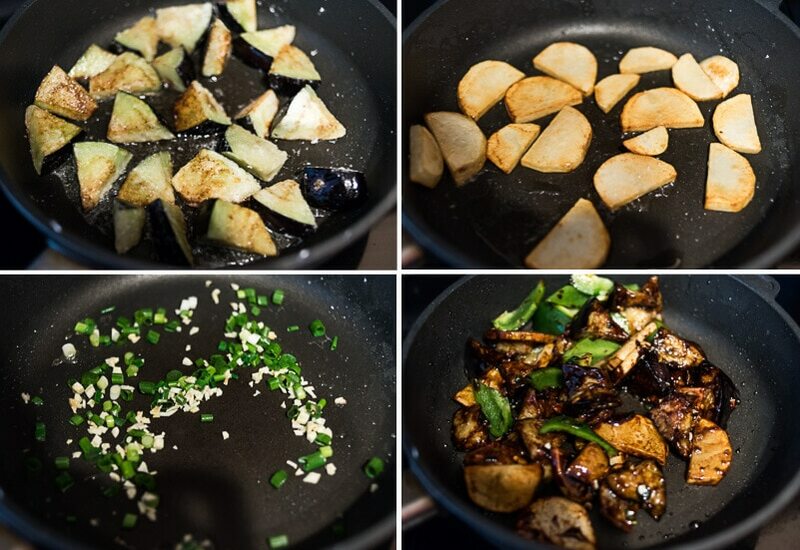 Return the eggplant and potato to the pan and add bell pepper. Cook and stir until the sauce is evenly coated over the vegetables. Transfer everything to a plate immediately. Garnish with sesame seeds (if using) and serve hot with steamed rice as a main or as a side. 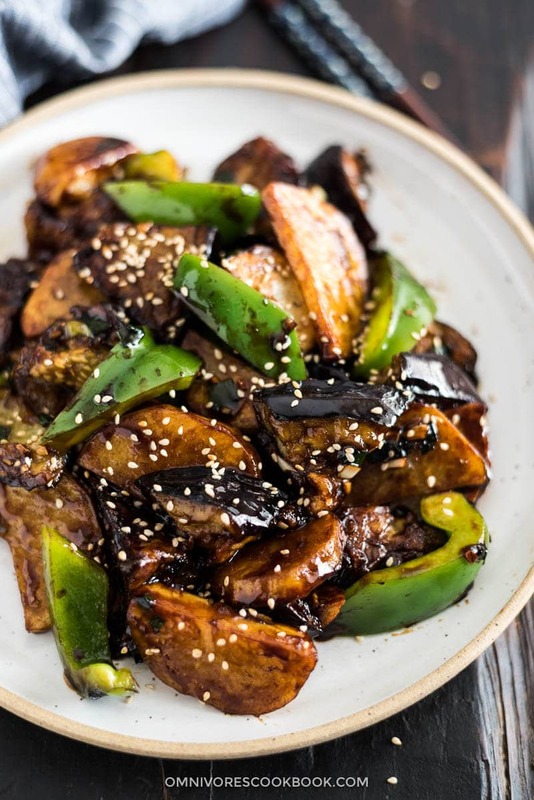 Dark soy sauce adds an appetizing dark brown color to the sauce. Regular soy sauce will work just fine but your dish will turn out lighter in color. Regular eggplant contains more liquid and is difficult to crisp up. You’ll obtain better results if you use Asian eggplant. Looks great! Reminds me of the good old days, eating this for lunch on 便宜街. Thanks Maggie, for an authentic recipe for di san xian. I have lived in China for six years and this is the first recipe for Chinese food that tastes just as good as at our favorite local restaurant. Actually it’s even better because I can use bell peppers instead of the green hot peppers that are typically served with the dish here in Qingdao. It got a thumbs up from my husband and son even though I cooked the eggplant a little too long on one side. Thanks a lot for this delicious recipe!! I just had “Di san xian” at a Chinese restaurant here in Sweden and I totally loved it.. so I had to make it myself today :-)! It turned out very nice and I’m already excited to look through your other recipes! Di San Xian is one of my favorite dishes too and very good way to eat a lot of vegetables! This is my third time to make di san qian, all in a week! I have been living in China for a little over a year and this is a great recipe and simple, thank you. I noticed the measurement for salt just says 1/2 though. I assume it was 1/2 teaspoon but I will actually leave it out next time to see what its like because the soy sauce brings some saltiness to it already. I also made it today with potatoes, mushrooms and slices of pork and it was yummy! Thanks so much, I will be checking out your other recipes. Hi Jodie, thanks very much for leaving a comment and correct my recipe! You’re right, I meant to say 1/2 teaspoon. Just updated the recipe now. Yep, I agree that soy sauce might brought enough saltiness to the dish. Sometimes I tend to make a dish a bit saltier, so it will goes with steamed rice. But please do feel free to adjust the saltiness according to your taste bud and the type of soy sauce you use. Oh I’m so happy to finally have found this recipe, but do you know how to do 西红柿炒鸡蛋??? and also 炒茄子? I’m kind of embarrased to ask you that but I really miss thoses chinese dishes…. Hi Amalia, I have two eggplant recipe. 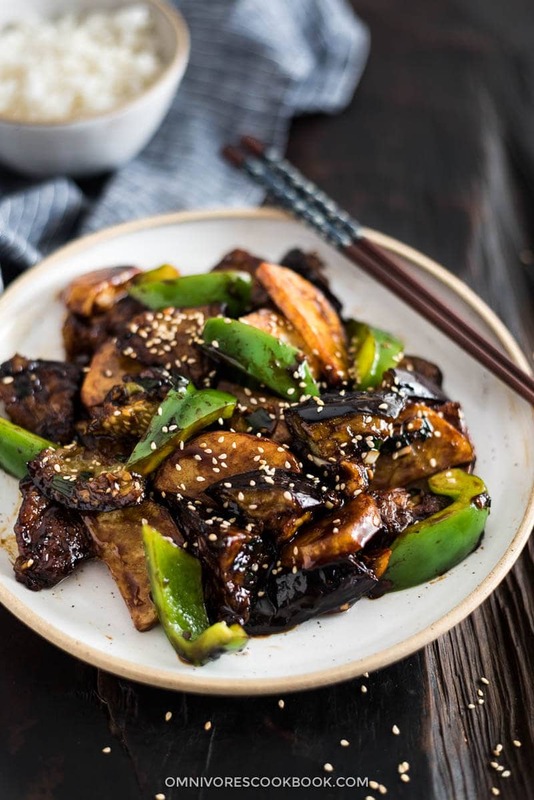 One is fish fragrant eggplant (鱼香茄子), you can find it here => http://104.236.198.25/recipes/fish-fragrant-eggplant/. The other one is Di San Xian (地三鲜), you can find it here => http://104.236.198.25/recipes/di-san-xian-recipe/. I am excited to try your dish! If I am making this as a side dish for 15 ppl (with 3 main dishes), Can you give me an idea on the amount of ingredients I would need to use instead? Also, how long can I make it in advance? I wont have time on the day of. Would it be bad to make it 2 days in advance and reheat it on the skillet when ready to be served? Hi Richa, I suggest you quadruple the recipe (each vegetable x 4 ). It will be a lot of cooking. You might want to consider the option of roasting the vegetables in the oven. 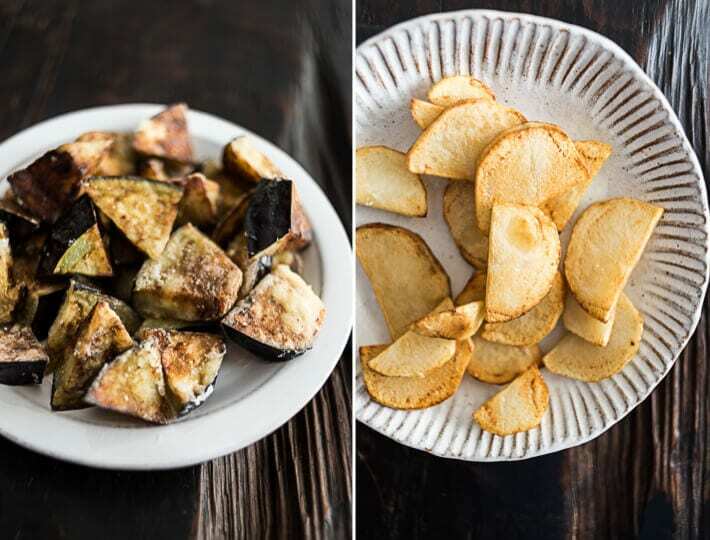 Chop the potato and eggplant into larger pieces, like bite size, coat with plenty oil, season with a bit salt, and roast them with high temperature (450F or even 500F) in the oven, to brown the surface. Then you make the sauce separately, by cooking the green onion and garlic in the oil, and mix in all the seasonings, without the cornstarch. On the day of serving, you can heat up vegetables in the oven. Then heat up the sauce in a large dutch oven on stove top. Slowly add cornstarch slurry to thicken it. In the end, you transfer the vegetables into the dutch oven, to mix them together. Btw, if you are not using Asian long eggplant, you can sprinkle salt onto them before cooking, and let them rest for 30 minutes to draw moisture out. Then you remove the liquid with paper towel. It will keep the eggplant firm and generate a better texture. You might also want to make more sauce. The original recipe uses just enough sauce to coat the vegetables. I figure you can cook more, so it will be more appealing to the guests => 1/2 cup light soy sauce (or soy sauce), 5 tablespoons sugar, 1/4 cup Shaoxing wine, 1/4 cup chicken stock, skip salt (since you need have added salt while baking), and a few more cloves garlic and more green onion. Of course if you prefer to follow the original recipe, you can do it on stove top by cooking in batches. You will need a very large pan for the last step, when you mix the vegetables with sauce. The dish will stay good for a day or two. The veggies won’t be crispy anymore, but should still be very flavorful. Thank you so much for going above and beyond to give me the alternate recipe! I truly appreciate your help. When you say to roast it in the oven…for how long would you think it’ll take in the oven and shall I toss the veggies around half way through the process? Also, if I don’t have a dutch oven, can I use a nonstick pot to mix the veggies with the sauce? Hi Richa, I think for eggplant and potato, you can try 450 F, roast for 10 minutes, take out once and stir, bake for another 10 minutes to 15 minutes, until the surface is charred and the veggies are cooked through. Bell pepper, depends on the size, the cooking time varies. But I won’t bake them for too long. They will become too tender. Maybe 10 minutes? A nonstick pot is no problem at all! Had all the ingredients at home so di san xiang for dinner tonight! I really like your “soak+salt+dust” method with eggplant. One thing I also do is rinse the potato slices, then soak in water with a little rice vinegar while I cook the eggplant. I think there’s some chemistry involved in the neutralising of starch or something. Works well with the julienned potato for tudou si (and substitute chopped cilantro stems for the green pepper). Thanks for yet another recipe with that authentic flavor! I was a bit worried about mixing crisp potatoes into the veggies and sauce, wondering it might become mushy. It didn’t and it was great! Thank you for the recipe, as always. I’ve not cooked much with Asian eggplant, but have heard the outer is less tough than other eggplant. This recipe sounds delicious and so easy to make! I always cook my stir fry in batches because it comes out better that way. Sometimes it’s a hassle if I’m short on time, but it’s always worth it! 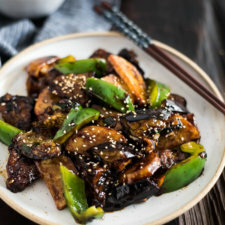 Just to let you know that the link at https://omnivorescookbook.com/20-asian-side-dishes says tomatoes and not potatoes. Ooops, sorry about that and thanks for pointing out the mistake! Dear Ms Omnivore Happy New Year! Although I can cook some of Chinese (am not Chinese) but i only do it in small portions for myself, mostly intuitively rather than following a particular recipe. I am a teacher of Chinese culture and philosophy. I teach in India at university. For the celebration of the CNY my Chinese colleague and myself were requested to make a Chinese menu and teach Indian Chefs to cook Chinese food (obligatory vegetarian!). I was very happy to find your page, as all dishes here look authentic and the recepies are very close to what my Chinese friends and colleagues would do at home. Our Indian chefs found them easy to follow and were able to cook for 200 people. From your cook book we cooked disanxian, dumpling dough and xihongshi chao jidan. Despite the large quantity everything turned out really good! This dish is fantastic! Thank you for sharing. I adore Asian food and can never manage to do a decent job of cooking it. Your instructions are clear and the results are amazing! I’ve made this recipe numerous times; so many, in fact, that I don’t remember whether I commented on it or not!! This dish is FAAAABULOUS! I usually eat it as a main dish, as it’s SO filling. One thing I did differently is I used Crisco shortening instead of vegetable oil (it seems to make things even crispier) and added a couple teaspoons of sesame oil. Keep this in your bucket list of “must tries” and enjoy it again and again!!!! Hi, found your blog by chance. Tried this recipe today, I really enjoyed it, the sauce is very tasty. I also love how you understand that a lot of us are first time cooks and need precise measurements and actual numbers, thanks for that! Last night, I made just the sauce and used it to replace the sauce in your ‘vegetarian chow mein’ recipe. This sauce was SO GOOD! I didn’t have dark soy sauce so just used the light soy sauce (Pearl River Brand) I had. I can only imagine just how time consuming everything you do is (cooking, food styling, photos, writing, etc…) so THANK YOU for sharing these recipes. I really appreciate it. The past two nights we’ve had two amazing dinners.